Production: Metro-Goldwyn-Mayer Pictures Corp.; Technicolor (opening and closing sequences in black and white), 35mm; running time: 101 minutes. Released 25 August 1939; re-released 1948. Filmed 1938–39 in MGM studios, Culver City, California. Producer: Mervyn LeRoy; screenplay: Noel Langley, Florence Ryerson, and Edgar Allen Woolf, from the novel by L. Frank Baum; uncredited director: King Vidor; photography: Harold Rosson; editor: Blanche Sewell; sound recording director: Douglas Shearer; production designer: Edwin B. Willis; art director: Cedric Gibbons; music: Harold Arlen; lyrics: E. Y. Harburg; special effects: Arnold Gillespie; costume designer: Adrian; assistant to Mervyn LeRoy: Arthur Freed; makeup: Jack Dawn. the Wicked Witch ); Charles Grapewin ( Uncle Henry ); Clara Blandick ( Auntie Em ); Pat Walsh ( Nikko ); Frank Morgan ( Professor Marvel; the Wizard ); the Singer Midgets ( Munchkins ). Awards: Oscars for Best Song ("Over the Rainbow"), Best Original Score, and Special Award for Judy Garland for her "outstanding performance as a screen juvenile," 1939. Zierold, Norman, The Child Stars , New York, 1965. Baxter, John, Hollywood in the Thirties , New York, 1968. Morella, Joe, and Edward Epstein, Judy: The Films and Career of Judy Garland , New York, 1969. Taylor, John Russell, and Arthur Jackson, The Hollywood Musical , New York, 1971. Juneau, James, Judy Garland , New York, 1974. Finch, Christopher, The Stormy Life of Judy Garland , New York, 1975. Peary, Gerald, and Roger Shatzkin, The Classic American Novel and the Movies , New York, 1977. Hirschhorn, Clive, The Hollywood Musical , New York, 1981. Dyer, Richard, Heavenly Bodies: Film Stars and Society , London, 1987. Altman, Rick, The American Film Musical , London, 1989. Cox, Stephen, Munchkins Remember "The Wizard of Oz" and Beyond , New York, 1989. Fricke, John, and Jay Scarfone, and William Stillman, The Wizard of Oz: The Official 50th Anniversary Pictorial History , New York, 1989. Harmetz, Aljean, The Making of The Wizard of Oz , London, 1989. Nathanson, Paul, Over the Rainbow: The Wizard of Oz as a Secular Myth of America , Albany, New York, 1991. Rushdie, Salman, The Wizard of Oz , London, 1992. Cox, Stephen, The Munchkins of Oz , Nashville, 1996. Harmetz, Aljean, The Making of the Wizard of Oz: Movie Magic and Studio Power in the Prime of MGM—and the Miracle of Production #1060 , New York, 1998. Morley, Sheridan, and Ruth Leon, Judy Garland: Beyond the Rainbow , New York, 1999. Clarke, Gerald, Get Happy: The Life of Judy Garland , Thorndike, 2000. Variety (New York), 16 August 1939. Nugent, Frank S., in New York Times , 18 August 1939. New Yorker , 19 August 1939. Green, Ward H., and others, in Photoplay Studies (New York), no. 12, 1939. Greene, Graham, in Spectator (London), 9 February 1940. Rosterman, Robert, "Judy Garland," in Films in Review (New York), April 1952. McVay, Douglas, "Judy Garland," in Films and Filming (London), October 1961. Sarris, Andrew, "Likable but Elusive," in Film Culture (New York), Spring 1963. Reid, John Howard, "The Man Who Made G.W.T.W. ," in Films and Filming (London), March 1967. Reid, John Howard, "Fleming: The Apprentice Years," in Films and Filming (London), January 1968. Lefèvre, Raymond, in Cinéma (Paris), February 1972. Tessier, Max, in Ecran (Paris), February 1972. Bolger, Ray, " The Wizard of Oz and the Golden Era of the American Musical Film," in American Cinematographer (Los Angeles), February 1978. "Following the Yellow Brick Road from the Wonderful Wizard of Oz to The Wiz ," in American Cinematographer (Los Angeles), November 1978. De Fornari, O., in Filmcritica (Rome), February 1979. Kahn Atkins, Irene, in Magill's Survey of Cinema 4 , Englewood Cliffs, New Jersey, 1980. Billman, C., "I've Seen the Movie: Oz Revisited," in Literature/Film Quarterly (Salisbury, Maryland), vol. 9, no. 4, 1981. Cinema Novo (Porto), January-February 1981. Hollywood Studio , vol. 17, no. 3, 1984. Soundings , vol. 67, no. 1, 1984. New York Times , 16 March 1984. Carpenter L., "There's No Place Like Home: The Wizard of Oz and American Isolationism," in Film and History (Newark, New Jersey), May 1985. Hagen, M., interview with Ray Bolger, in Films and Filming (London), July 1985. Selcer, R. F., "Home Sweet Movies," in Journal of Popular Film and Television (Washington, D.C.), no. 2, 1990. Conlon, J., "Kansas, Oz, and the Function of Art," in Journal of Aesthetic Education (Champaign, Illinois), no. 3, 1990. Lindroth, J., "Down the Yellow Brick Road: Two Dorothys and the Journey of Initiation in Dream and Nightmare," in Literature/ Film Quarterly (Salisbury, Maryland), no. 3, 1990. MacDonnell, F., " The Emerald City Was the New Deal: E. Y. Harburg and the Wonderful Wizard of Oz," in Journal of American Culture (Bowling Green, Ohio), no. 4, 1990. Rushdie, S., "Out of Kansas," in New Yorker , 11 May 1992. Catsos, G. J. M., "That Wonderful Witch," in Filmfax (Evanston, Illinois), October-November 1993. Norman, Barry, in Radio Times (London), vol. 280, no. 3655, 29 January 1994. Brantley, Ben, "Why Oz Is a State of Mind in Gay Life and Drag Shows," in New York Times , 28 June 1994. Duncan, Jody, "'They Keep Going and Going'," in Cinefex (Riverside), no. 59, September 1994. Caron, André, "'The Definitive Collector's Edition of The Wizard of Oz ,"' in Séquences (Haute-Ville), no. 177, March-April 1995. Roberts, T., in Film Score Monthly (Los Angeles), no. 59/60, July/August 1995. Parla, P., "Interview with Harry Monty," in Classic Images (Muscatine), no. 248, February 1996. Flynn, R., "Imitation Oz: The Sequel as Commodity," in The Lion and the Unicorn , vol. 20, no. 1, 1996. Friedman, B., "Relinquishing Oz: Every Girl's Anti-Adventure Story," in Michigan Quarterly Review , vol. 35, no. 1, 1996. Page, Linda Rohrer, "Wearing the Red Shoes: Dorothy and the Power of the Female Imagination in The Wizard of Oz ," in Journal of Popular Film and Television (Washington, D.C.), vol. 23, no. 4, Winter 1996. Rees, R.R., "Munchkin Memories: Margaret Pellegrini," in Classic Images (Muscatine), no. 266, August 1997. Sullivan, D., in Scarlet Street (Glen Rock), no. 25, 1997. Celeste, R., " Lost Highway: Unveiling Cinema's Yellow Brick Road," in CineAction (Toronto), no. 43, 1997. McCarthy, Todd, "Enhanced Reissue Proves Wizard Still Works Like Magic," in Variety (New York), no. 372, no. 13, 9 November 1998. Sragow, Michael, "A Forgotten Maker of the Unforgettable: A Name Deserving of Credit: Victor Fleming, Creator of Great Films, Favorite of Great Actors," in the New York Times , 15 November 1998. "By courtesy of the wizards of Hollywood The Wizard of Oz reached the screen yesterday as a delightful piece of wonderworking which had the youngsters' eyes shining and brought a quietly amused gleam to the wiser ones," begins Frank Nugent's review of The Wizard of Oz in The New York Times . Produced and distributed by MGM at a cost of $2.5 million, the film is a tribute to the Hollywood style and system of filmmaking. It was a bit of "wonderworking" indeed, as this fantasy film would forever alter the course of the Hollywood film musical. Begun in 1938, The Wizard of Oz was produced at the apex of the classic Hollywood era, when MGM had at its disposal the foremost technical experts available in Hollywood at that time. It was this standby of talent that made the production of a film like Wizard feasible. To mount such a project today would cost at least $50 million. Ray Bolger (the Scarecrow), then a contract player at MGM, explains: "Working at MGM during that period was the ultimate in motion picture making, musical or otherwise." Wizard was photographed in a little-used three-strip technicolor process. In this process, three separate strips of black-and-white film were exposed through a prism which segregated the three primary colors. It was an extremely intricate process to handle and required enormous amounts of light to properly expose. While it was the most expensive process available to Hollywood at the time, it yielded an unequaled color quality. The studio chose the three-strip process because it worked out well with black-and-white stock. The framing of Dorothy's fantasy was processed in black-and-white, heightening the effect of the technicolor journey to Oz. The fact that the three-strip process originated in a black-and-white stock made this easier. For these reasons the production of Wizard occurred entirely indoors on the sound stages of MGM. Because the film was studio-bound, a lot of responsibility fell on the special effects department. Mattes were used extensively to give depth to the Kansas landscape, and a sense of distance to the Land of Oz. Intricate trick photography was employed to allow a bicyclist and a man rowing a boat to float helplessly in a tornado. No less important was the MGM art department. It was headed at the time by Cedric Gibbons whose career garnered 11 Academy Awards while at MGM. Elaborate sets were conceived and constructed in full scale to create Oz, the Wicked Witch's sanctuary, and the throne room of the Wizard of Oz. Working with the limitations imposed by the tri-color film process, Gibbon's department had to create a color scheme that the film stock could exploit. The result was a beautiful, color-conscious mise-en-scène. Perhaps most miraculous was the role played by Jack Dawn and the MGM makeup department. It was Dawn's task to take three nonhumans—a scarecrow, a tin man, and a lion—and bring them to life. He had to give them personalities and human characteristics that would evoke an humanity amidst the costumes dictated by their roles. This was done convincingly, resulting in three of the most elaborate makeup/costume designs to date in Hollywood: the costumes did pose certain critical problems for production, however. Bert Lahr's costume for the Cowardly Lion, for instance, weighed nearly 100 pounds. This, coupled with the intense heat caused by the lighting needed to shoot, made filming for long durations impossible, and the film had to be shot in segments with a day's shooting often ending before a scene was complete. As a result, before the next day's shooting could begin, makeup had to be meticulously matched and perfectly recreated to retain consistency. Daily rushes were used to aid this process. While this precision slowed down the production, the commitment to perfection became a trademark of MGM. For their efforts both Jack Dawn and Cedric Gibbons received Academy Award nominations (though Gibbon's contract insured that his name would appear in the credits of all MGM films regardless of his involvement). This recognition, while falling on individuals, was no less a tribute to the system. It was a recognition of the elaborate collaborative nature of Hollywood filmmaking. Though Wizard remains an elaborate technical achievement for its time, the technology involved has since become obsolete. Perhaps the longterm contribution of the film is the precedent it set for the type of Hollywood musical identified with MGM. Wizard was perhaps the earliest example of what came to be called the "integrated musical." Traditionally, music in films had been incorporated in a performance setting, establishing logical moments in which to include musical numbers, such as the review films of the thirties, including Golddiggers and Forty-Second Street . 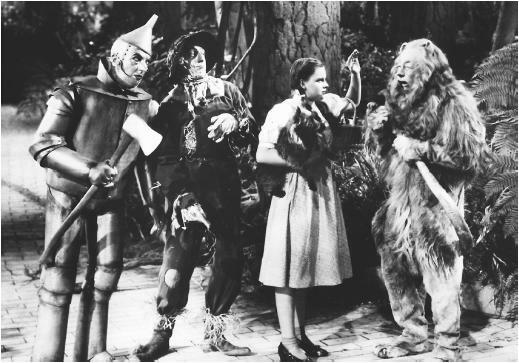 In The Wizard of Oz the music became another dimension of the characters' language, an extension of their personalities and feelings. There is no intrinsic logic in Dorothy's singing "Somewhere Over The Rainbow," but it is understood as a viable expression of some inner longing. The film narrative is advanced by musical numbers. Songs often replace dialogue as when the Munchkins pay tribute to Dorothy for killing their nemesis, the Wicked Witch of the East. In Wizard , music isn't a digression, but instead a fundamental part of the narrative structure. The Wizard of Oz has witnessed more than 20 years of revival on both television and in theaters, remaining widely popular. Internationally, the film has enjoyed wider distribution than any other American film in history—fantasy, musical or otherwise. It would seem that the directness of the film's message—"There's no place like home"—and the sincerity of its presentation is the key. However, beneath the fantasy is one of the most polished and elaborate productions ever mounted in Hollywood. The film remains a reminder of that as well.